Shimla's salubrious climate, easy accessibility and numerous attractions have made it one of the most popular hill stations in northern India. The splendid views of the show-clad ranges of the Himalayas, fine walks through oak and flowering rhododendron, enchanting resorts within easy reach, golf Naldehra and skiing at Kufri and Narkanda make Shimala an attractive destination throughout the year. THE RIDGE - SHIMLA: The large open space in the heart of town presents excellent view of the mountain ranges. 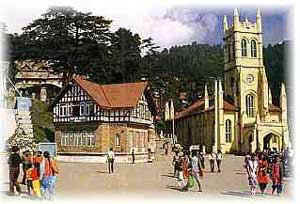 Shimla's landmarks-the Neo-Gothic structure of Christ Church and the new-Tudor library building are worth seeing. 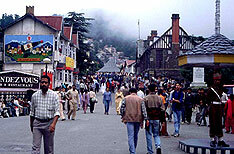 THE MALL - SHIMLA: Main shopping centre of shimla with restaurants. the Gaiety Theatre, which is a reproduction of an old British theatre is a center of cultural activities. A passenger lift of HPTDC can be taken from the Cart Road and the Mall. Lakkar Bazaar adjacent to the Ridge is popular for its wood crafts and souvenirs. 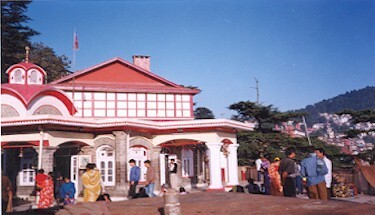 KALI BARI TEMPLE - SHIMLA: Few yards from scandal Point towards General Post Office. It is believed that the idol of Goddess Shayamla is enshrined there. JAKHOO TEMPLE (2.5 Km) 2455 m: Shimla's highest peak offers a panoramic view of the town. An ancient "Lord Hanuman" temple. 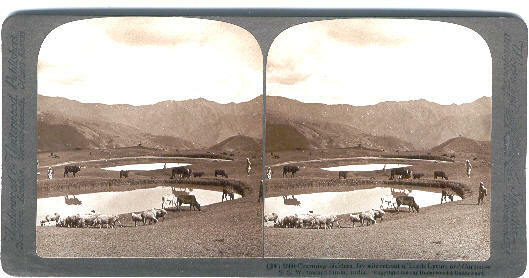 Way from Ridge near Church (on foot) One can also hire pony or taxi to visit the temple. 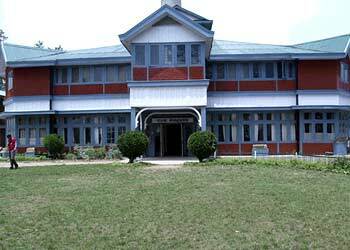 STATE MEUSEUM (3 Km): Ancient Historical Sculptors and paintings of Himachal Pradesh. Visiting hours 10 AM to 5 PM. Closed on Monday and gazetted holidays. 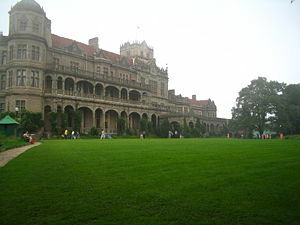 INDIAN INSTITUTE OF ADVANCED STUDIES (4 Km) 1983 m: This magnificent English renaissance structure was the former Viceregal Lodge. Its lawns and woodland are added attractions. Entry by ticket. 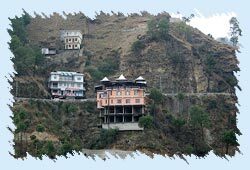 PROSPECT HILL (5 Km) 2155 m: Crowned by a temple dedicated to Kamna Devi 15 minutes walk from Boileauganj on shimla Bilaspur road. the hill offers a spectacular views of the area. 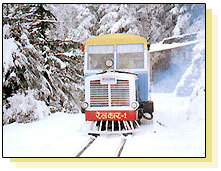 SUMMER HILL (7 Km) 1983 m: A picturesque superb on Shimla-Kalka Railway line. Offers shady walks in quiet surroundings. 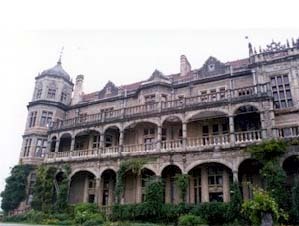 The Father of Nation, Mahatma Gandhi during his visit to Shimla lived in the elegant Georgian House of Raj Kumari Amrit Kaur. HP University is situated here. CHADWICK FALLS (7 Km) 1586 m: Surrounded by thick forests. About 45 minutes walk from Summer Hill Chowk. SANKAT MOCHAN (7 Km) 1975 m: On Shimla-Kalka road (NH-22) is famous "Lord Hanuman" temple. It commands an excellent view of Shimla town. The place can be visited by Bus/Taxi. 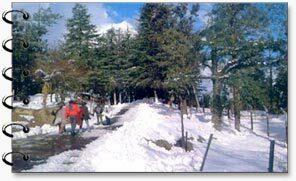 TARA DEVI (11 Km) 1851 m: On Shimla - Kalka road (NH-22) this holy place is accessible by Rail, bus and car. From the station/road-one can visit the temple either on foot or by taxi / jeep. FAGU (22 Km) 2450 m: On Hindustan-Tibet Road. It has enchanting views. 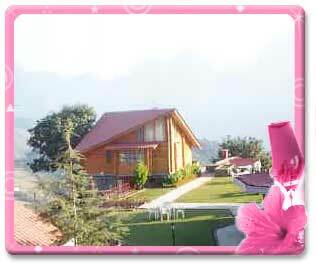 Himachal Tourism runs the Hotel peach Blossom. 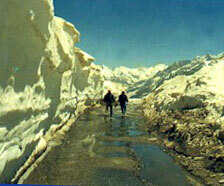 NARKANDA (60 Km) 2708 m: On the Hindustan Tibet road, Narkanda offers spectacular views of snow ranges. An uphill trek through Deodar woods leads to Hatu Peak (8 Km). Ancient temple of Hatu Mata is alive with skiers. 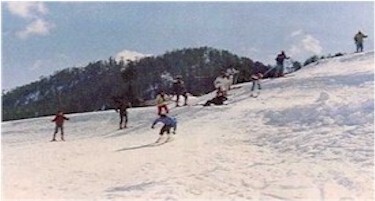 HPTDC runs Hotel Hatu and in winters short skiing courses are organised. KOTGARH (82 Km) 1830 m: Motorable, bifurcation from Narkanda (18 Km) Land of apples and apricots. SARAHAN (176 Km) 1950 m: On Hindustan Tibet Road from Jeori Sarahan is (17 Km) with spectacular view of Srikhand range. Sarahan has the majestic Bhimkali Temple. 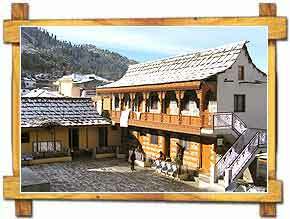 Himachal Tourism runs Hotel Shrikhand. Saharan is the gateway to Kinnaur. A Pheasant Breading Centre and stadium are worth visiting. KHARAPATHHAR (85 Km) 2673 m: Motorable on Shimla-Rohru road. 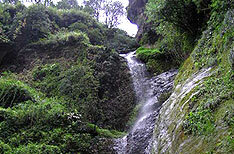 A famous religious shrine Giriganga is 7 Km on foot or by jeep. HPTDC Tourist complex Giriganga Resort under construction. JUBBAL (90 Km) 1892 m: Headquarters of the erstwhile Princely State, Jubbal has a superbly maintained Palace which was designed by a French architect in the 1930 and is remarkable mix of European and indigenous styles. HATKOTI (104 Km) 1400 m: Motorable on shimla-Rohru highway. Famous for ancient temple of Mata Hateswari in the midst of paddy fields on the right bank of the Pabber river. HPTDC runs Hotel Pabber here. MASHOBRA (12 Km) 2148 m: Motorable on Shimla-Naldehra road. 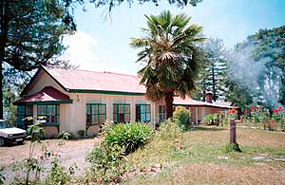 Surrounded by thick forests and offers ideal walks. Goddess Durga temple is worth seeing. CRAIGNANO (18 Km) 2149 m: Motorable on Shimla-Naldhera road, Ideal picnic spot with lawns and garden. NALDEHRA (22 Km) 2044 m: Motorable On Shimla Tattapani road. this is a nine hole golf course. It was designed by the British viceroy, Lord Curzon who was so enchanted by this place that he gave his daughter Alexandra, Naldehra as her second name. 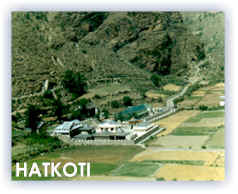 Ancient Nag temple is also situated here. 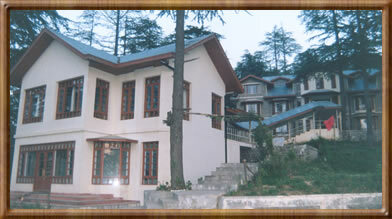 Himachal Tourism runs Hotel Golf Glade here. CHINDI (94 Km) 2010 m: Motorable on Shimla-Mandi highway via Tattapani - A beautiful place in Karsog Valley. 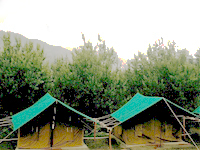 Himachal tourism's tourist Resort is opening shortly. One can also visit famous mahunag Temple (18 Km). 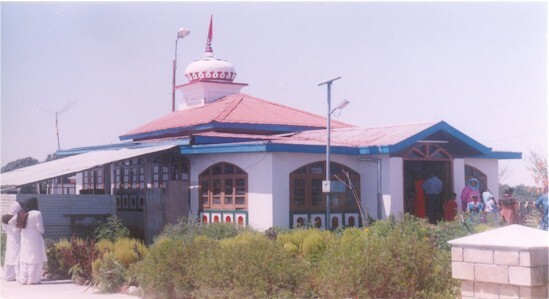 Mamleshwar mahadev Temple (13 Km) Kamaksha Devi temple (19 Km) Pangna Killa/temple (8 Km) and Shikari Devi Temple (18 Km).